There are some restaurants that, over the years, have gained a reputation for not being up to the same standard of decent food found elsewhere around Walt Disney World. Amongst those who visit often, the mere suggestion of dining at these locations can often result in mocking and ridicule. One such location, Pinocchio Village Haus, has held on to this title for many years, which is precisely the reason I decided to dine there a few months back. Let’s start off with the setting first. There is a corner of my heart that is extremely fond of the artwork and story scrolls that decorate the walls of Pinocchio Village Haus. The Pinocchio figure, holding a mug and a piece of cake against a cornucopia of fresh fruits and vegetables, is a great way to welcome guests to the ordering area. Oh, and the restaurant’s view of the it’s a small world queue is one of the best quick service views on property. There has been a lot of work put in around property to upgrade menus with new items, specifically dishes that are healthier. In the case of the menu at Pinocchio Village Haus this includes a salad and a selection of flatbreads. 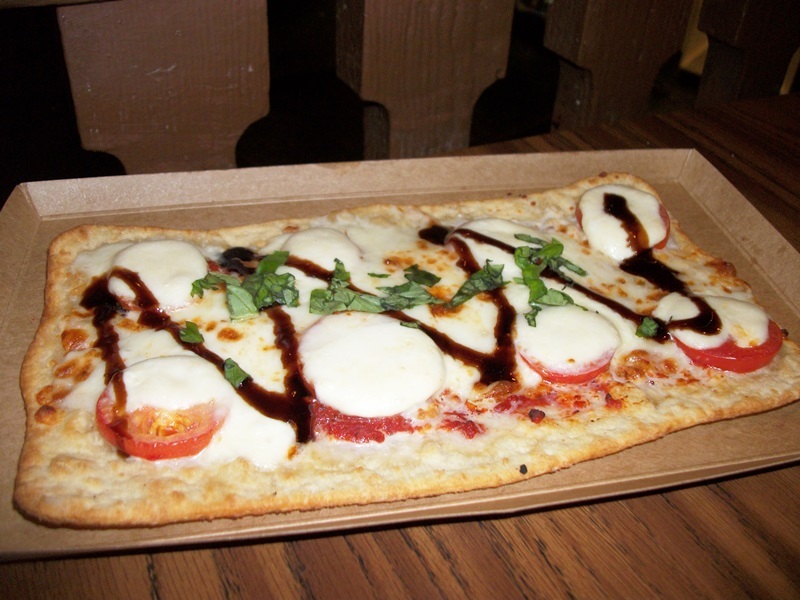 We opted for the Caprese Flatbread, a flatbread with a base of tomato sauce, sliced tomatoes, mozzarella, fresh basil, and a drizzle of balsamic vinaigrette. 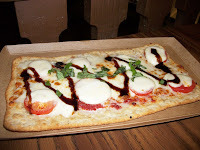 It was better than some of the healthier options shopped around by fast food restaurants, but not as good as some of the other flatbreads served at quick service locations around Walt Disney World. The mere fact that it utilizes fresh tomatoes and basil makes it a winner in my book. Pinocchio Village Haus has been holding to the Italian eatery identity for quite some time now, so we also opted for one of their staples, the Meatball Sub Sandwich. 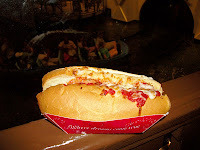 A toasted bun is filled with marinara, meatballs, and topped with bubbling cheese. The meatballs are not the giant sized pieces you get with most subs, instead they are small, bite-sized options, which makes for an easier sandwich to eat with less mess. It is a utilitarian sub, but on par with many of the angus burgers found all around property. For so long we have derided Pinocchio Village Haus as a less than appealing option for dining in the Magic Kingdom. Oh sure, we all miss their unique Figaro Fries, but other than that the Fantasyland staple has not been a required stop on the Walt Disney World foodie trail. While I wouldn’t go as far as to say it rivals the lunch at Be Our Guest, the Village Haus’ menu has pulled itself up to being on par with many of the quick service locations inside the Magic Kingdom. Feel free to stop by and give it another chance, because it has earned the opportunity. I still have to try the new & improved menu at DL's Village Haus. In the bad old days, I remember staring at my half-eaten meal and thinking, "how is it even possible to create a chili-burger that tastes like nothing at all?" It was seriously like eating chewy, musty air.